Life as an adolescent is scary and confusing. In a weight-obsessed world that dictates what a "perfect body" should look like, teens who are insecure about their bodies see food as the enemy and reason they can't fit in with the popular crowd. Plus, in a volatile season of quick romances and breakups, strained or broken family ties, and academic expectations, food and emotional eating can be a teen's only coping mechanism to soothe a broken heart or deal with poor grades. Part accessible self-help guide and part constructive hands-on workbook, It's Not What You're Eating, It's What's Eating You teaches young people who struggle with low self-esteem and body insecurity to stop focusing on food as an answer to life's problems and to start getting to know themselves and what they value and want in life. 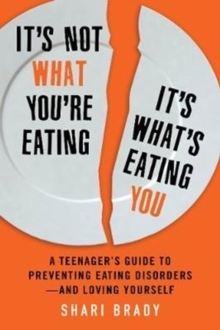 Covering addictions and disorders like anorexia, bulimia, obesity, and binge eating disorder, this book also shows teens how to stop negative thought patterns, maintain meaningful and healthy relationships, indulge in self-care, love their own bodies, be happy, and take charge of their lives. With personal anecdotes, practical tips, and hands-on writing exercises, author Shari Brady redefines our dysfunctional relationship with food. Instead of allowing food to dictate our emotions, let it nurture and nourish our bodies and souls, as it is meant to!